Thai - Hawaii night at Acadia community center. Beverly Beyette from LA Times wrote a quite good piece on her return to Thailand, the resorts and my favorite place, Phi Phi island. Click to read the LA time article. Stay Away, is the Danish Goverment advise to travelers to Bangkok, where PAD (the Peoples Alliance for Democracy) have occupied several goverment offices and blocked trafic in central parts of Bangkok. delegates than four years ago. 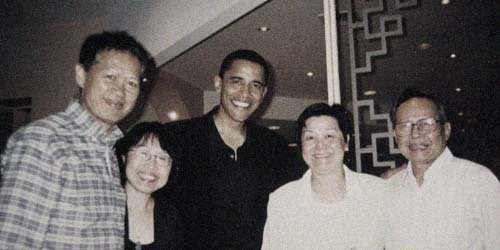 "Our community’s rising political strength comes at a good time, given Senator Obama's self-identification as one of us, an honorary Asian American by virtue of his kinship, upbringing and beliefs." What happened to Clinton.? I keep reading quotes saying Biden brings "old School Cred", Im sorry but If for one don't see that we need Old School or Catholic credibility in this country, we need new vision to engage maybe the biggest international and environmental challenges any leader have ever had to tackle. Not old-school-anything. Come on Obama, do better than this. A lot of my Asian friends is asking "Why Bother Anyway..?" If you don't choose to be part of moving the country forward and choose to be heard, then at least please stop sending me emails complaining that nobody is listening to the Asian community. Nobody is going to hear you if you don't make your self heard, no matter who you are going to vote for. Cambodia and Thailand have agreed to withdraw from border temple, Cambodian officials say. The agreement was reached at a meeting of military officers from the two countries on Wednesday. Only a small contingent from each side would remain at Preah Vihear temple, a top general said. More than 1,000 troops have been engaged in a stand-off at the ancient site for a month. An international court awarded the temple to Cambodia in 1962, but land surrounding it remains the subject of Thai territorial claims. The decision by Unesco in June to list Preah Vihear as a World Heritage Site reignited lingering tensions over unresolved border disputes between the two countries.